There are moments when I want to spread The Scientific Method, and create a competition to the religious groups that conquer people and get adepts, through this kind of cheap propaganda. Yes, it is cheap to try to get more adepts whenever exploiting their weaknesses and moments of sorrow. Not many people realize how the mass transportation system, can be used for preachers and missionaries, to expose them to the good news, but what good news.? If at the end you are going to be bounded by a series of outdated rules that form no part of a viable social contract. Jehovah's Witnesses are the latest material I've found in the last couple of months, around route 16 with the Hillsborough Transportation System, there should a separation between State and Religion, but avoiding and cutting these people on using public system into spreading their message is almost impossible. It makes me think that a humanist approach is less acceptable on the public light, than a religious approach, on a political environment not accepting God is an inspirational suicide, as well in certain companies that follow a Christian doctrine. Not matter how many times I go outside, it seems savings souls is a big business, what happened to follow any noble truth without buying the propaganda.? It doesn't seem profitable for a bunch of individuals such as The International House of Prayers or almost any other newer and growing denomination. There are some guerrilla tactics on these methods, as much of the time the spread of materials could be done by placing them strategically that someone will find them, also people sitting silently in the bus, or some other people who try to engage in conversation and try to disarm the speech of the interviewer, as he or she needs God. There are plenty of ways to disarm them, to counter attack as even if there is an existence of a mighty being in this universe, that has no body, that being wouldn't go into such as cheap tactics into gain followers. With the different informational supplements that can be found anywhere, it can be seen how humanity is essentially divided into seeking an absolute truth through a series of fragmented ones. Maybe, we are seeking that truth on Earth, while the truth could lay outside in the vast mantles of the universe. It is true that every head is an universe, and different people think vastly different even if they can agree on similar points; but yet there can be some discomfort on the religious aspect as it tends to represent the conjunction of social momentum of an individual. Yet, there is the ideological war, where we tend to forget our own humanity. 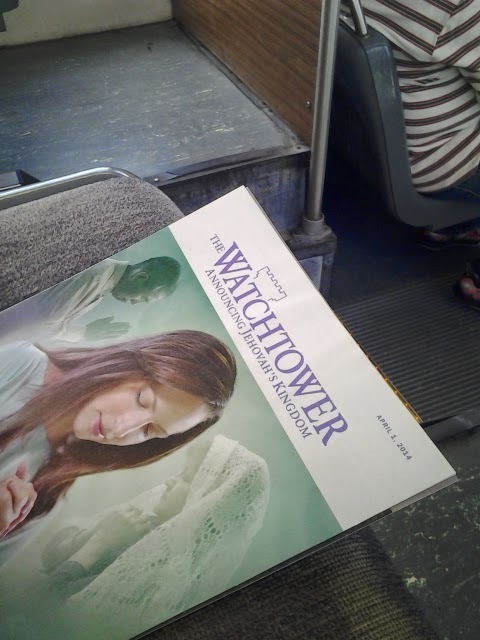 The main problem on this ideological war is when we start to attacking each other; every time I find a Watchtower magazine in the bus, I read a magazine filled with accommodated truths and some pseudo scientific content, that only contains support from the Bible to claim anything. Yet, how can believe in a cult that has tendencies of seen the apocalypse everywhere and almost and at every time a tragedy happens.? People believe so, if someone emotionally is broken they will go the first light they will see.